Welcome to Les Arcs ! 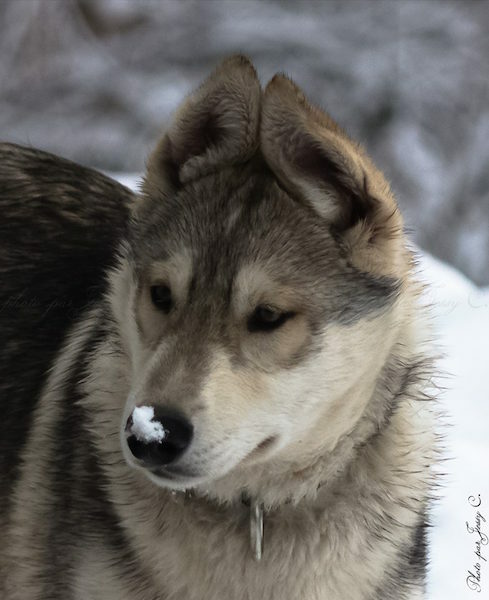 Passionately fond of snow and sliding we offer dog sled rides. Comfortably ensconced in our handmade sled come and experience the surprising world of sled dogs. Our incredible dog colleagues will be glad to show you their admirable talents and to share a moment of exchange and complicity with you. 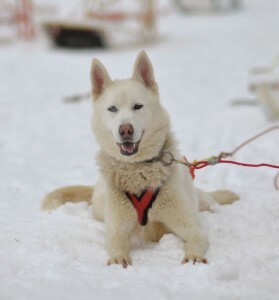 It is possible to book your dog sled rides from Monday to Sunday. In comparison with the other means of transport, sled dog offers matchless advantages. It needs highly diversified and renewable natural resources. It shoots off even by Siberian temperatures. It can run on almost every ground including stretches of water. It has its own healing and reproductive system. To top it all, it has a warning device and as a free gift, it offers you night concerts. Its most important quality will ever be, what any manufacturers will never be able to integrate to his machines, its presence, a friendly one ! 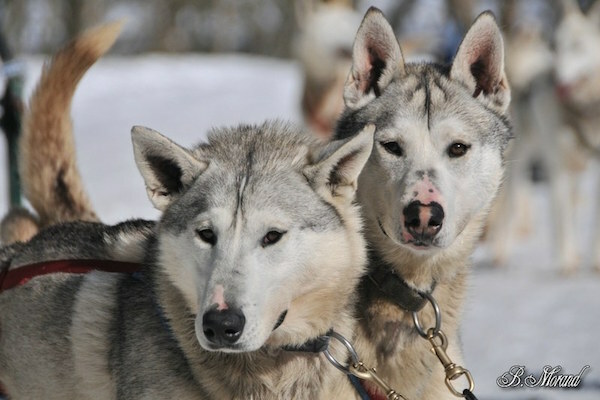 the activity consists in sitting in a dog sled while we are driving it and our dogs are pulling it. The number of people seated in the sledge depends on the stoutness, the age and the physical conditions. We generally harness between 4 and 8 dogs by sled. The team composition is obviously based on the number of people in the sled, the dogs’ strength, the weather conditions and the dogs’ willingness (a dog who doesn’t show any sign of enthusiasm before a start will never be forced to go). 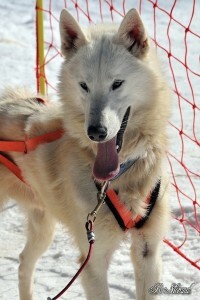 Discovery dog sled ride : total activity time 45 minutes, ride lasting between 20 to 30 minutes. The malgovert trip : total activity time 1hour, ride lasting between 30 to 40 minutes. Give me some snow and some dogs, you can keep the rest KNUD RASMUSSEN, Danish explorer (1879-1933). I have been sharing Vincent’s passion for sledge dogs for 7 years. 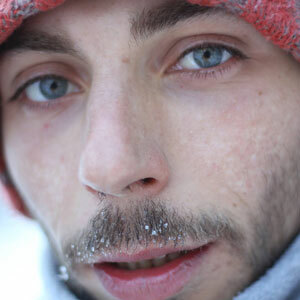 At first I was not predestined to live a musher life. I was preparing a teaching diploma at the university (I was hard-working but bored) when I met Vincent. Then I discovered a whole new world, the sled dogs’ one. Instantly, I fell in love with them, Vincent and his dogs. So I alternated the student’s life with the learning of mushing. Once I finished my studies, Vincent and I decided to take over the family pack. Today I am involved in the academic world and in the associative sector. My vocation is to transmit my knowledge and passion. I’m sporty, I’m fond of mountain and cold and I love to exercise with my dogs. I have always been around the sled dogs and the Native American cultures since I was born. 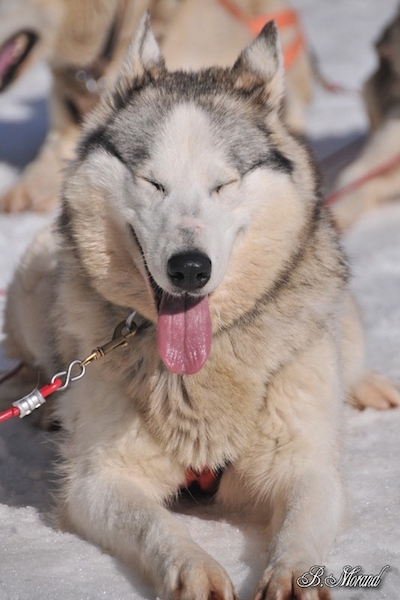 I began sled dog competition at the age of 6. My parents spent 25 years practicing mushing. Naturally, I always had a family life full of trips, of encounters and of four-legged friends. In the early 2000s, we went to Quebec where we stayed for a while in order to meet trappers and Native Americans. When we came back in France, I met Bérengère. 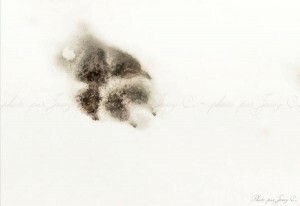 At that time, I was helping my parents as a musher during the winter seasons. 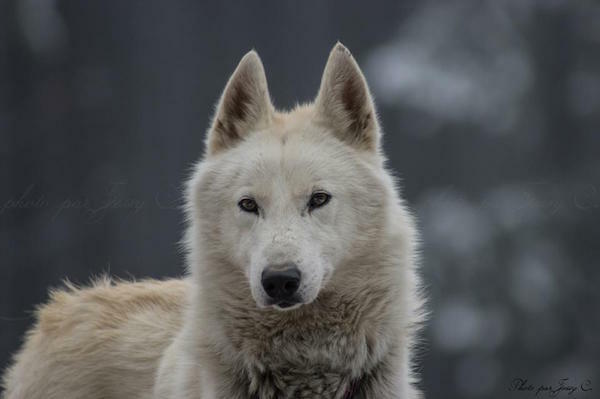 As Bérengère and I were anxious to ensure the welfare of the family pack and at the meantime, conscious of the daily and necessary maintenance of the kennel, we decided to take over the management of the dog population. Today, we keep on promoting the dogs’ talents and sharing our passion with people. More than working animals or pets, we consider our dogs like true friends and colleagues. We ensure together the sustainability of the kennel. 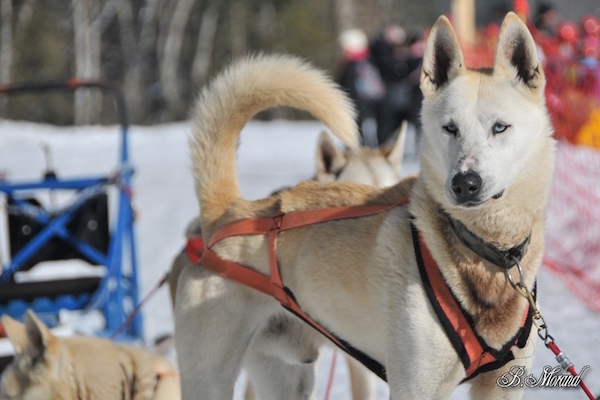 In order to protect sled dogs and to promote their talents, we have created the association ALASKAN WABAN. Our four-legged friends are ALASKAN HUSKIES (mixed bred Siberian Husky and Alaskan, of Quebec and Alaska lineage). Unknown in France, Alaskan is yet the most important population of sled dog in the world. 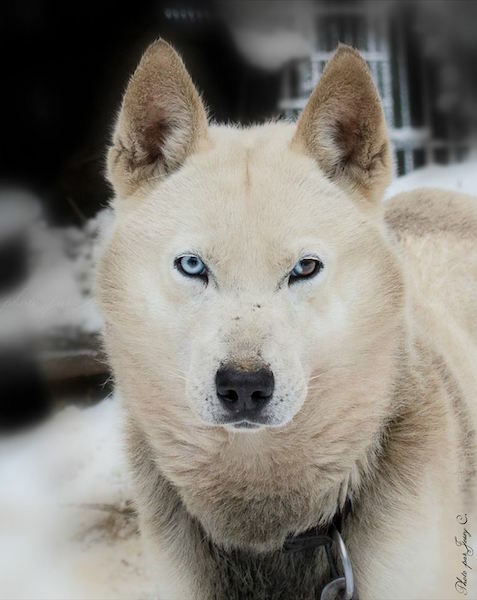 Created at the beginning of the 20th century by Alaskan mushers, from cross-breeding of Siberian Huskies and native Indian dogs and from some other working dogs, Alaskan husky has become the most efficient sled dog in the world, combining endurance, stamina and speed. They are generally small dogs from 40lb to 55lb and by the way also less sensitive to sports traumatology than the other Nordic breeds. Nevertheless, people don’t really notice differences between Alaskan and his ancestor, Siberian Husky. 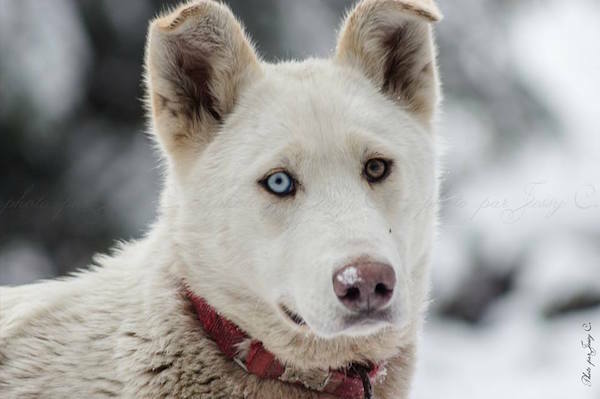 In the true biological sense of the term, this breed represents among 90% of the world’s sled dog population. 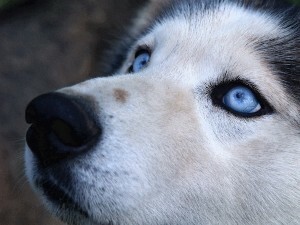 Of course, the largest dog breeding farms are in Alaska and Canada. This extraordinary dog, a pure snow marathon runner, composed the vast majority of the dog teams during the recent Grande Odyssée. 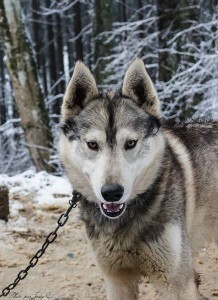 (the most important sled dog race in France), Professor Dominique Grandjean. Very sociable and cheerful, Alaskans are true fireballs ! They may have trouble keeping quiet. They need space and exercise to unwind. They are great nature admirers. Nevertheless they never refuse to take a nap in the sun or on a sofa. Do you want to make a surprise ? We propose gift vouchers ! 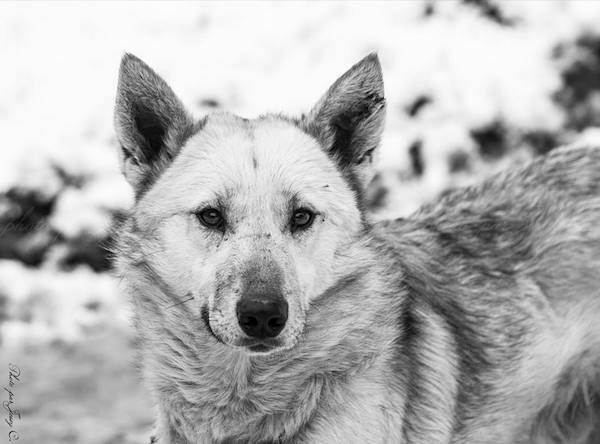 In order to ensure your security and to protect our dogs’ welfare, we reserve the right to suspend or to cancel the activity in case of major unpredictable occurrences or of climatic variations. In order to fully appreciate the ride, it is necessary to be in good health. You must not have medical contraindications that prevent you from doing leisure activities with dogs in a mountainous environment. You have to be well equipped for the mountain: gloves, sunglasses, scarf, hat, warm boots (but not skiing boots please !). As the trail is not flat, some bumps may be felt depending on the snowfall. That’s why, for safety reasons, we DO NOT take pregnant women, people who have recently had surgery, and children under 5 years old. Children under 10 years old must be accompanied by an adult. Children must wear a helmet (available if necessary). We deny all liability for accidents if these safety instructions are not observed.  We are unable to answer emails during the winter season. Please call us instead. 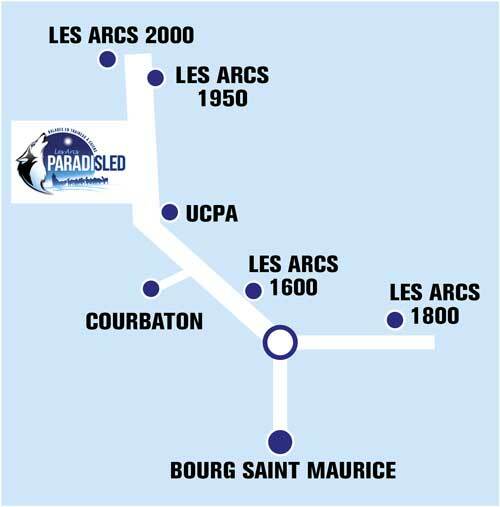 FREE SHUTTLE BUS BETWEEN ARC 1600 and ARC 2000 ask “LE PLATEAU” stop.